At 19 weeks pregnant, I had my "20 week ultrasound" and along with finding out that our baby was a girl, we also found out that my cervix was dilated about 1.5 cm and my waters were starting to bulge. I was sent immediately to the hospital to have a cerclage placed. Before the procedure could happen, we realized that I was leaking amniotic fluid and the cerclage was no longer an option. We were sent home terrified and with poor odds of staying pregnant until viability (23 weeks). They even prepared us on a home birth and how she could come right on out any day and there was nothing that could be done for her - she would pass away in our arms. If we did make it to 23 weeks, I was to be admitted to the hospital until our baby was born or until 34 weeks (when they would induce). Over the next four weeks, we had our weekly ultrasounds and learned things we never thought we would have to learn. Things that wouldn't happen to us, only to other people... right? Four grueling weeks later, I made it, I was admitted! Even with her foot and umbilical cord hanging out of my cervix for almost two weeks! I got settled in and was prepared to spend Halloween, Thanksgiving, Christmas and New Year's Eve in the hospital. An NICU doctor came in to talk to me and my husband about what to expect if our girl came now that she was 23 weeks. I really didn't think that applied to us because, I was aware of the significant differences between having a baby at 23 weeks versus 34 or even 28 weeks. I was planning on keeping her cooking until the following year. Ok, at least until after Thanksgiving. At least. Well, she came before Halloween. Olivia was born at 23 weeks and 4 days. Fast forward to the whirlwind of suddenly realizing that we have an extremely premature, fragile, precious baby in the NICU. The machines, the wires, the tubes, the sounds, all the terminology, the frustration, the emotions, the statistics, the odds. It is terrifying watching your precious baby being poked and prodded and there is nothing you can do about it except be there and know that this is what is keeping her alive. We didn't make it this far to lose her, dammit. The nurses, doctors and respiratory therapists are all pretty great and update us on the plan for Olivia each day and take time to answer questions which, we always have. We started out jotting notes in a notebook. Notes from the morning rounds and new medications.. It was pretty unorganized, actually. 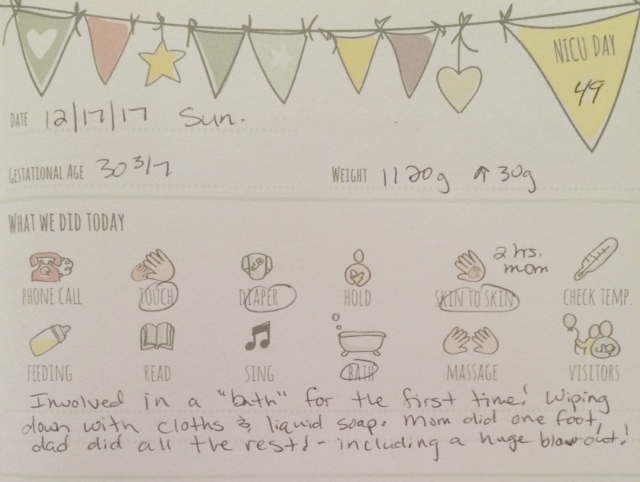 Then, my husband stumbled upon Our NICU Journey - Daily Notes. I bring that book with me to and from the hospital every day, I want it with me all the time! 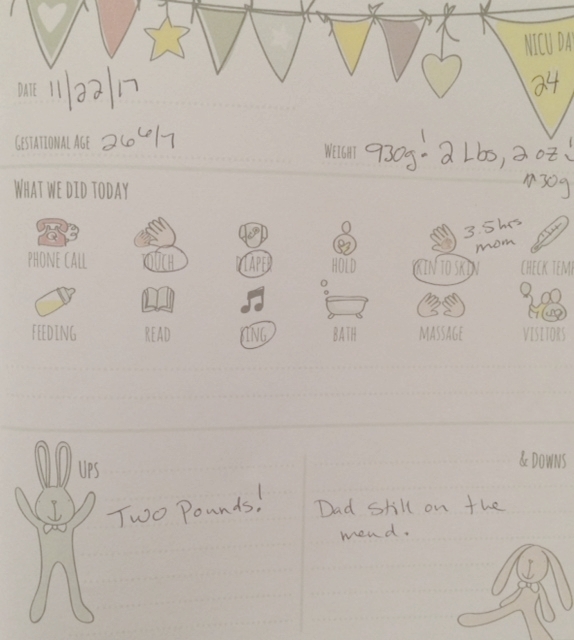 It is so nice having a structured journal to keep track of her weight, feedings, medications, nurses, etc. We've used it to look back to answer: How old was she when she opened her eyes for the first time? How many days did she make it on the CPAP last time? What day did she have her broviac put in? Sometimes it feels like the past 51 days has gone by so fast, sometimes it feels like it has taken forever. We have learned so much yet, there is still so much more to know. The nurses have helped us and encouraged us to be involved with Olivia's cares - changing diapers, taking her temperature, oral cares, etc. That makes us feel more like parents and helps us learn more about our daughter. This is one cruel and scary rollercoaster ride. We have quite a ways to go before our baby girl can come home with us and absolutely nobody knows when exactly that will be. One day at a time is truly the only way to do this. And, while I missed out on my third trimester and a "normal" pregnancy, we get an extra four months to spend with our daughter and to get to know her. An update from mom - Olivia came home on April 2 - without a trach! She ended up extubating herself and then received a second course of Decadron before coming home. She was on oxygen at home for only six weeks. I can't even begin to describe the emotions I feel having her home sweet home. We just celebrated Olivia's first birthday last month! So far, time is flying by as quickly as they always say it does. She's a pretty happy baby and we're working on trying to crawl and say some words. If you want to share your story about how Every Tiny Thing products have helped you on your journey, email us any time! Thanks Dianna, for sharing your beautiful daughter and your story with us! What Can I Do With My Baby in the NICU?